Black Belt boot camp will be this Saturday beginning at 8:00 A.M. at the ATA school in Valdosta. All Black Belt students who are midterming should be there as well as all Belt Belt Recommended students that are testing for their Black Belts. 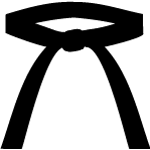 Black Belt testing will be help Thursday, February 16th at 7:00 P.M. Please come out and support the Black Belt students in their quest to become better and help us encourage our Black Belt Recommended students to do well on their testing.